Founder of Galician Stained Glass Yurii comes from a family tradition of artists who have offered the finest workmanship in ironwork, woodwork, and painting for generations. He carries on that tradition by creating distinctive glass artwork for an American audience, which frequently features patriotic themes, pop culture, and American history. Galician Stained Glass is a family owned and operated business. 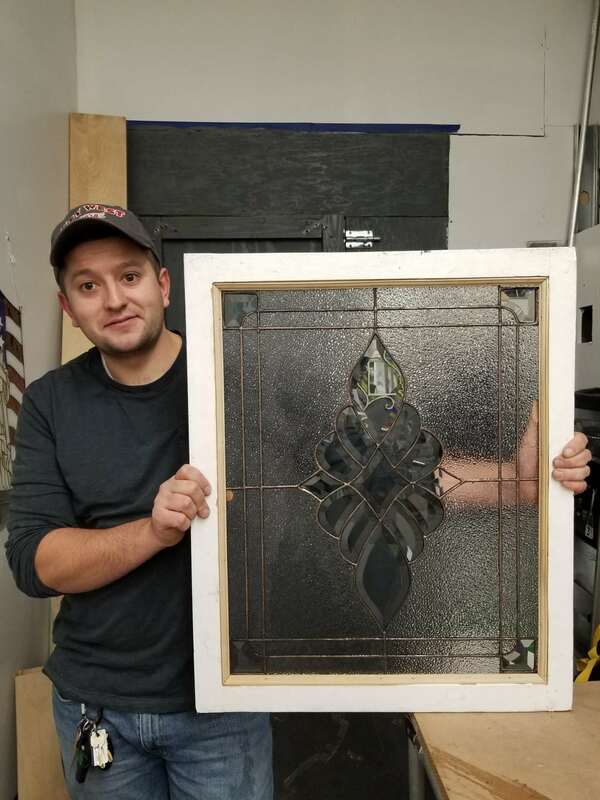 “ I take pride in my stained glass projects because allow only impeccable work and I use only the finest materials to bring your vision to life,” says Yura. 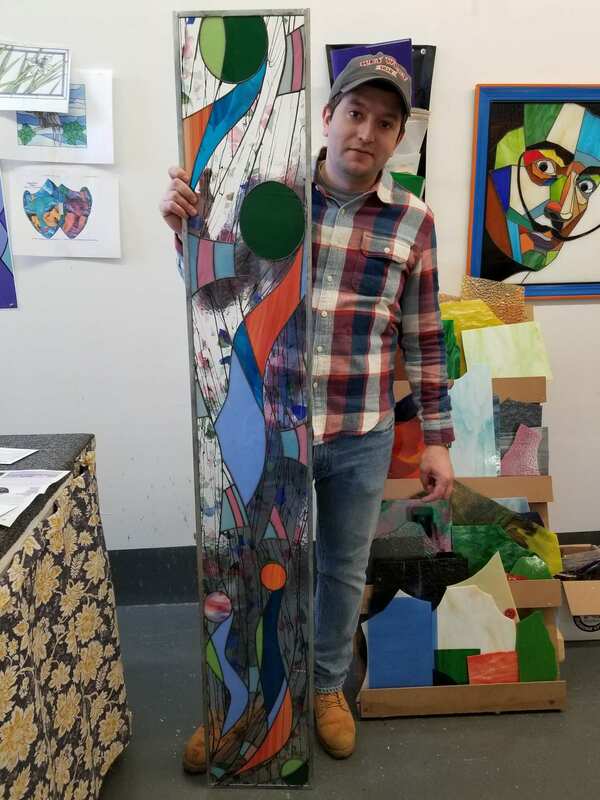 I will create a unique masterpiece for you, since the stained-glass studio I represent specializes solely in masterpieces. All of my custom stained-glass designs are carefully and individually planned, accounting for the effect changing light has on the balance of color and transparency, ensuring an artwork is visually pleasing in a range of lighting conditions. Each glass part, each paint drop is a part of art for me. And I hope these things will also become a piece of your personal art when you get them in your interior. If the front repair is needed, we neatly remove the colored panel in order you could keep it safe. If you cooperate with me, you will get many benefits for yourself, because I always consider all customer’s wishes, act fast and well, have fair prices, can provide you with all kinds of works needed either withdrawal or installation of the item. On site repairs available. Stained glass installation appears a laborious, technically complicated process. But you don’t need to hire dozens of contractors to handle the installation. Luckily, I am full service provider. I will design fabricate and install it for you. 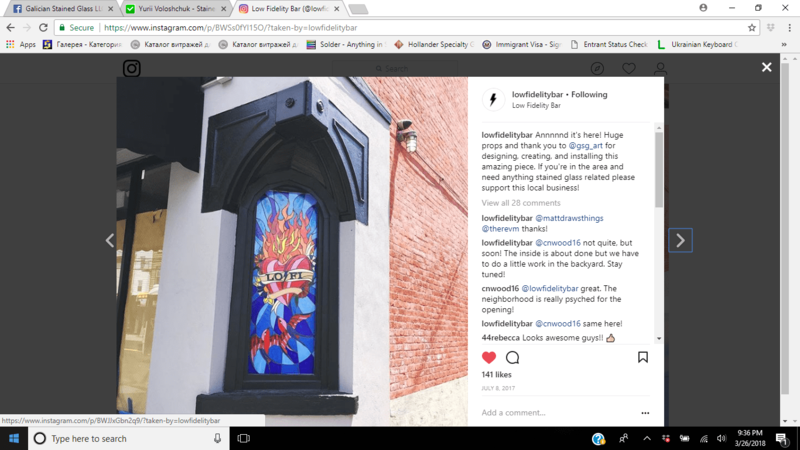 Stained glass is most commonly associated with church and cathedral window art, but my mission is in bringing lively visual art into all venues including your home, office, and public buildings. I pride myself on versatility and producing unique contemporary stained-glass artwork. My modern spin on this age-old art form is exactly what sets me apart. 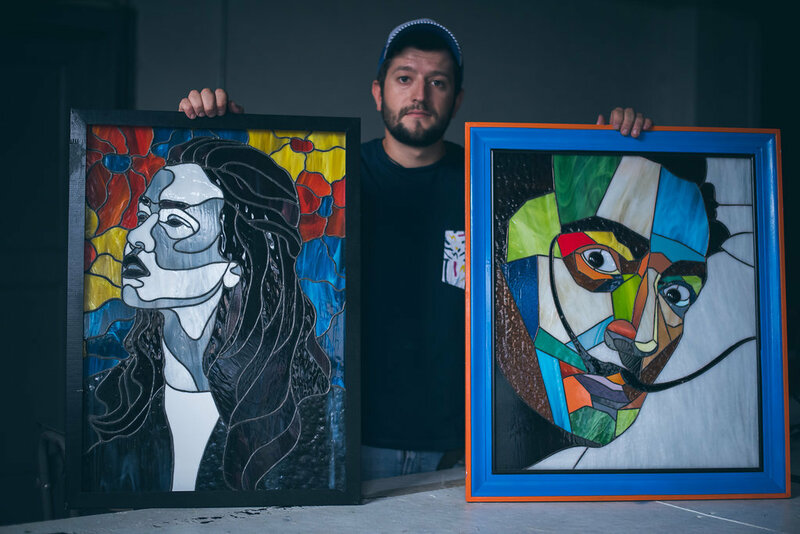 Inspired by pop art designs, Stained Glass Portraits became my favorite commissioned pieces. It’s all started from portrait by the end of the day. I love taking picture portrait and transform it into stained glass. This could be a great gift idea for someone you love and care. I am accepting commissioned portrait orders of any size and any complication. You can backlit your portrait and enjoy it 24/7. We used Galician Stained Glass to design two windows in our bathroom. The windows are beautiful and exactly what I wanted, and the work was done promptly even over the holidays! They were so nice and easy to work with as well. Would definitely recommend them and plan to use them again for a transom in our entrance way. My wife and I came to Iurii with only the beginnings of an idea, we wanted a stained glass transom window. Iurii and his wife were incredibly helpful in helping us to build that basic idea into a beautiful work of art. They allowed for us to be fully involved in every step of the process making this a completely custom and personal piece. The final result was beyond our expectations. Annnnnd it's here! Huge props and thank you to @gsg_art for designing, creating, and installing this amazing piece. 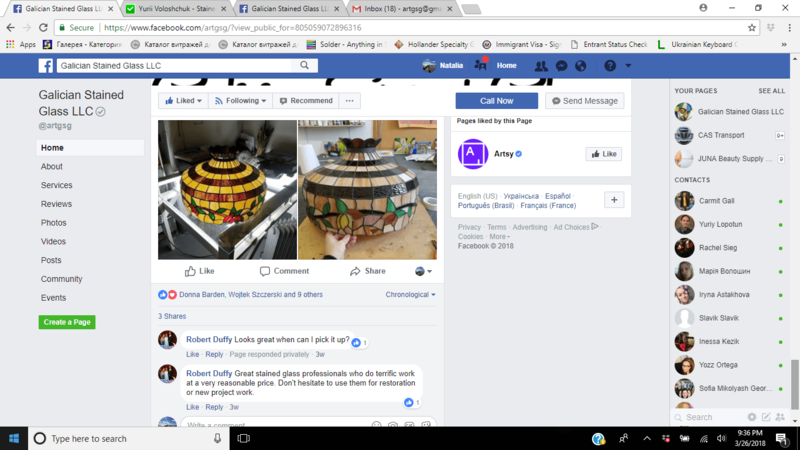 If you're in the area and need anything stained glass related please support this local business! Thanks guys!!! I messed up and was supposed to let Yurii post this first but I didn't know! He's awesome and his shop is in the heights. Will link to his Instagram when he posts because he's amazing and everyone should follow him. Great stained glass professionals who do terrific work at a very reasonable price. Don't hesitate to use them for restoration or new project work. Choosing the right design is always hard and sometimes stressful. Galician Stained Glass is always happy to guide you through the challenging process of choosing beautiful artwork and interior design elements for your home or business by creating original unique design that meet the highest standards. That’s why we also created a small catalogue of designed patters that will ease your life. All designs can be modified in structure and colors and can be applied to windows, panels, kitchen cabinet designs, stained glass door inserts, niches and ceilings. soldering and finishing your piece. 3 hour workshop available for small groups up to 5 people. Perfect for special event celebration. No skills required. All materials included in the fee. Tuition fee is $45 per person. Register within the next 3 days to get your FIRST CLASS FREE! Take the first class for FREE!